Students joined faculty and community members in planting trees on Oct. 14. Photo by Bailey Hovland. 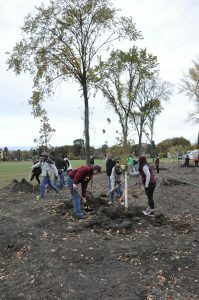 Over 50 students, faculty, and community members met the morning of Saturday, Oct. 14 to plant a swath of trees east of Concordia’s soccer fields for an event hosted by the Student Environmental Alliance. The group convened at the planting site at 8:45 a.m. and participants continued to trickle in throughout the morning despite the cold weather. SEA Co-President Haylee Worm expressed both thrill and surprise at the turnout. Jerry Raguse, Concordia’s head of grounds, was also pleased at the number of participants. In just an hour, the group had planted 30 trees. Raguse explained that the new installation of bur oak, elm, hackberry, honeylocust, linden, Ohio buckeye, and quaking aspen trees would be more long-lasting and aesthetically pleasing than the original “shelter belt” that had previously been in place. With the new variety of trees, disease and harmful insects will have less chance of spreading. Most of the original trees were recently removed from the area. Thanks to the added shelter provided by Moorhead’s housing expansion, the new trees can facilitate more of a park setting than just a windbreak. “I proposed re-planting so that we could revitalize the area. We’ll be planting some grass in here and I think it’ll just be a really nice area,” Raguse said. Students echoed Raguse’s excited outlook on the area’s future. Marin Wilts, a first-year biology student at Concordia, attended the re-planting and said that she hoped to return to the site long after her time at Concordia was over. “Imagine coming back here in 20 years and saying, ‘That’s my tree!’” she said. Other students were drawn to the tree-planting by the opportunity to engage in their community and take part in environmental sustainability. Signe Johnson, a sophomore at Concordia, said that she and her friends love to connect over environmentally-focused events. The event attracted people from across the community. Concordia students were joined by several faculty members and even MSUM student Claire Carpenter. She heard about the event through her involvement in Concordia’s Circle K chapter, the collegiate equivalent of Kiwanis. Carpenter hoped that more MSUM students would take part in service activities through the tri-college system.